Fall is in the air and I am looking forward to baked apple pies and soup. However, we still have some warm days in the forecast and it doesn’t feel quite right to jump into the “cold weather” meals. Plus mama is back full-time to work and trying to keep up with the kids’ school activities isn’t for the faint of heart. An afternoon spent baking would be a luxury I don’t have at this point. That doesn’t mean we have to serve frozen meals though. A meal that uses fresh, whole ingredients is still a must. Last night I was able to get these sandwiches on the table in 15 minutes. Win! And they satisfied my fall cravings…for now. Enjoy! Heat a griddle to 325-350 degrees. Butter the outside of the bread. 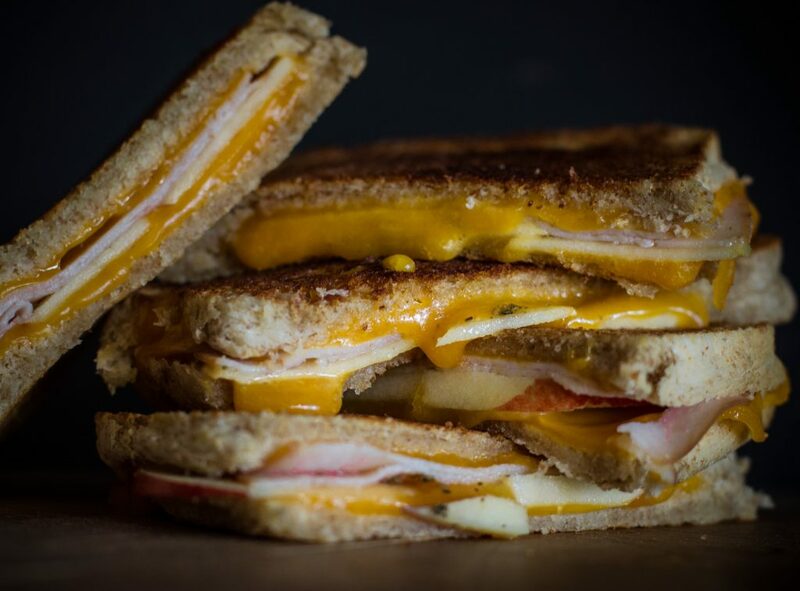 Layer sharp cheddar cheese on both halves, with the apple slices and turkey in the middle. Sprinkle lightly with the rubbed sage. Put together and cook on the griddle until cheese is golden brown. I smash my sandwiches with the back of a heavy saucepan so the cheese melts better.